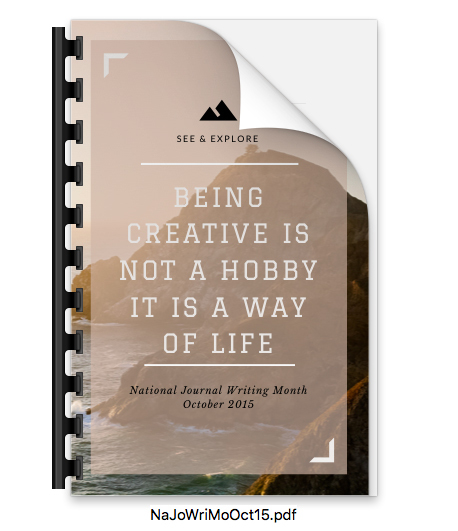 At the end of each NaJoWriMo month, I export my journal entries for that month and save them as a PDF, which I find more enjoyable to read on my iPad than in the Day One application. Today I created my book cover in Canva.com, which is provides book cover templates and graphics. You can customize a template with your own image and text. Canva also provides images and art work at a very affordable price, typically less than $5. If I had more time, I would have sought out a different background image, but this one serves its purpose. If you would like to use this image, here’s the download. 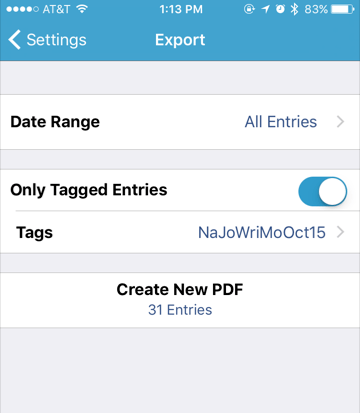 If you’re a Day One journal app user, you can export your entries based assigned tags. My entries for last month were tagged, NaJoWriMoOct15. Click on the tag icon in the menu bar of Day One and filter the tag you used for those entries. Then click the Export button on the right side and select Export…, and save your PDF in a folder. Note: you can also export entries from the iOS version of Day One. Open settings, and filter your entries by tag and export the PDF to a supporting PDF app on your device. 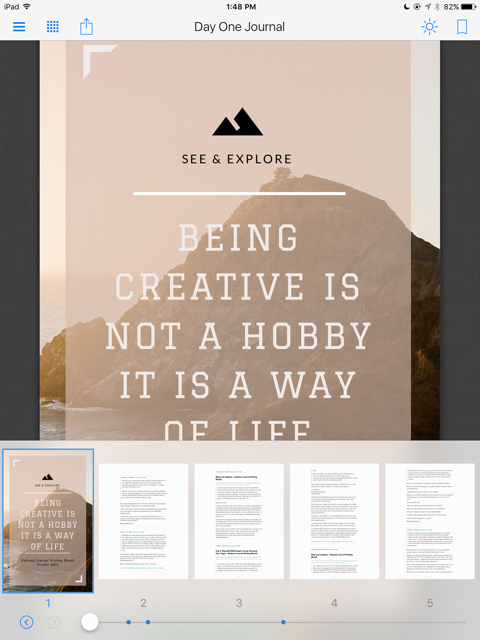 Open your saved PDF, and click on View > Thumbnails. 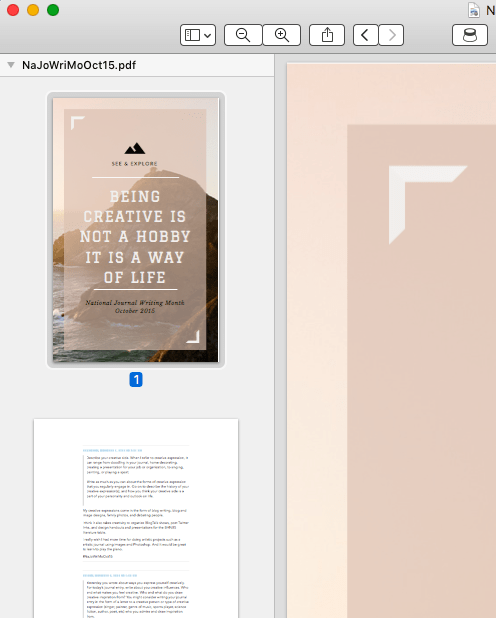 Drag and drop your PDF or image cover art above the first page of your PDF, and then save the PDF. I probably won’t re-read my NaJoWriMo entries until several months from now, but it’s nice to know it’s archived in another place, in addition the Day One backups. The Kindle app doesn’t allow for annotating PDFs, so if I wanted to, I could export the PDF to a supporting app like Highlighter or iAnnotate to highlight I want to review in the future. The PDF version of Day One pages are well designed, and they retain the formatting of entries very well. I hope yo found this tutorial useful. If you try it, come back and let me know how it worked for you, or what you did differently. Also, if you’re new to Day One, check out my book, Starting From Day One: Using the Day One Journaling App to Record and Enrich Your Life. 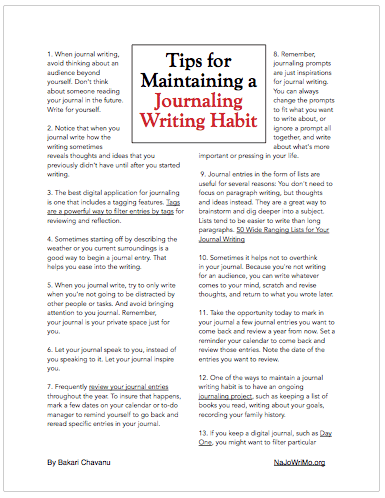 It explains all the features of Day One for the Mac and iOS, and includes journal writing prompts and projects for getting the most of out of using Day One and journal writing.